Nick Kyrgios produced two underarm serves in an impressive win over Dusan Lajovic in the Miami Open third round on Sunday. 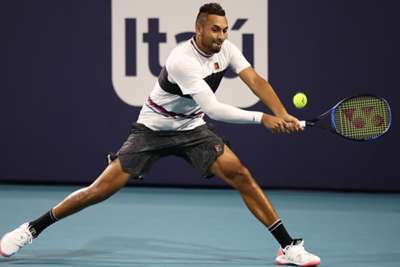 Kyrgios put on a show in a 6-3 6-1 thrashing of Lajovic at the ATP 1000 event in Florida. The Australian 27th seed first aced Lajovic with an underarm serve, then later won another point using the same tactic. In a characteristic Kyrgios display, he was also involved in a verbal exchange with a spectator, while he also delivered a stunning no-look volley winner.